Dr Teena has lots of experience within this field of dentistry, and dentures are a procedure that she feels very passionate about. From partial dentures and flexible dentures, to full dentures and those used as intermediary treatment before dental implants – Rouse Hill Smiles is able to provide a reliable and long-lasting solution to suit each individual patient. Dentures are custom made to fit your mouth, so they take on the appearance of your natural teeth. Gone are the days of loose or ill-fitting dentures. 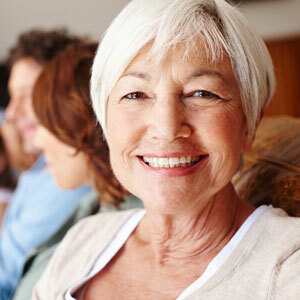 Instead, our dentures are expertly-designed to feel comfortable and enhance your day-to-day life. When you receive denture treatment from Rouse Hill Smiles, you know you’re in safe and reliable hands. Dr Teena has performed countless denture fittings with high success rates and gains immense satisfaction from being able to help her patients smile, chew, and talk with ease again. Our simple, 5-step denture procedure begins with you attending your initial consultation and having your first oral impression taken. Once your dentures have been produced, our dentist is able to remove your tooth or teeth and fit your dentures immediately. Dr Teena will then review your dentures after two weeks and assess the healing process. After three to six months, we will then adjust and re-line your dentures to ensure they remain comfortable and effective. Lastly, your dentures will need to be replaced every eight to ten years on average, particularly as you grow older and your facial structure begins to change. Are you considering dentures or are your existing dentures causing you concern? Contact our practice to schedule a consultation today. Our professional and friendly team are always here to answer any questions you may have.